SECOND PRINTING Variant Cover by Kev Walker. by Jeff Parker & Kev Walker From Marvel Comics. The Heroic Age is here! The new era for Marvel's always-evolving, always controversial team kicks off here! It's a beginning, a return, a departure, and an arrival of a new artist (Marvel Zombies 3 & 4's Kev Walker) all rolled into one in a fresh, shocking status quo! The most dangerous people on Earth are now all in one hellish prison, and the only way out is through rehabilitation and contribution to society via The Thunderbolts...under the leadership of the steel-hard-skinned Avenger named Luke Cage! So bring on the first participants: Juggernaut! Crossbones! Ghost! Moonstone! And...Man-Thing? 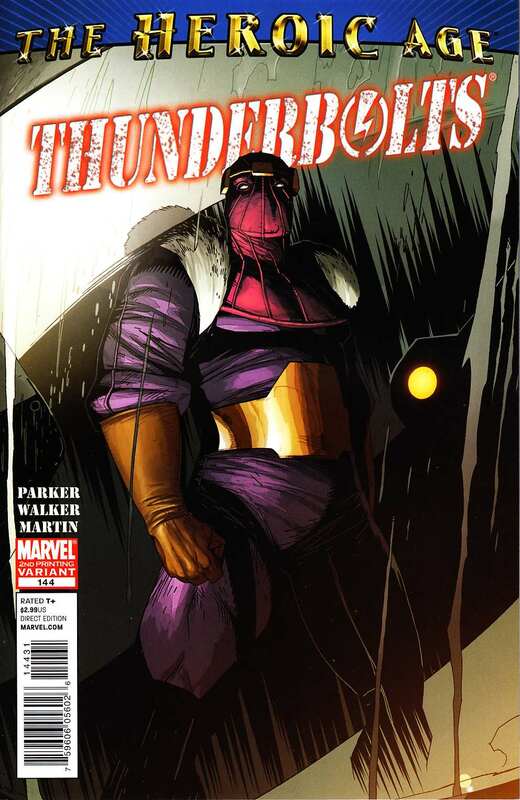 Against the sordid recent history of the group as a black ops kill squad, can Power Man restore the Thunderbolts to their rightful potential?